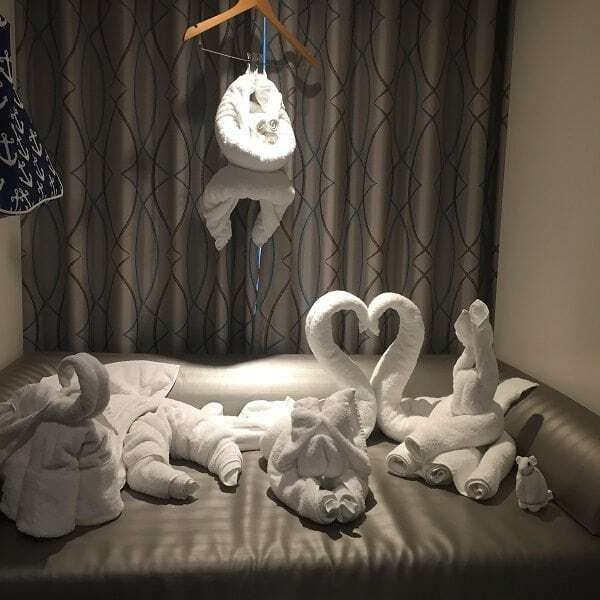 A bright alternative to the typical inside room on the world’s largest cruise ship, the Central Park View Stateroom on Harmony of the Seas offers traditional inside cabin prices. 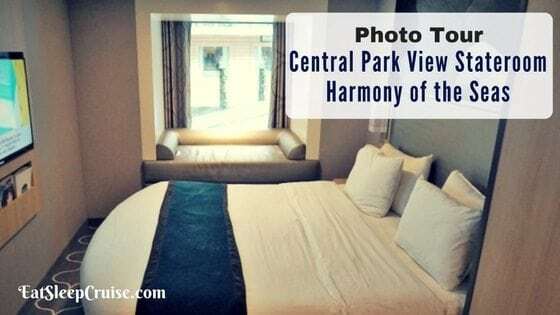 With a few upgrades and some slight modifications to similar interior cabins found on mega ships, we document our experience in our complete photo tour of the Central Park View Stateroom on Harmony of the Seas. Located on Deck 9, our stateroom 9615 was only one deck above Central Park which is on Deck 8. Given the location, the room is considered a “view” room, as there is no balcony. Instead, you have a large window that overlooks Central Park. 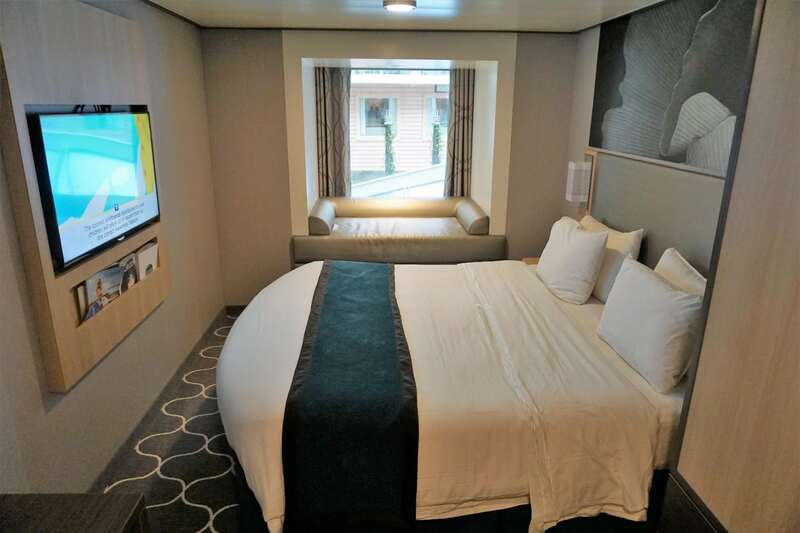 So, instead of a regular stale inside room with no natural light or views, you can get a glimpse of life outside with the Central Park View Stateroom on Harmony of the Seas. Also only a short walk from the forward elevators, you are not far from the action on the lower Promenade deck or on the upper pool decks. Entering the room, the set-up felt longer and a bit narrower than other inside cabins we have experienced on other Oasis-class ships. Compared to typical large inside rooms, which are about 170 square feet, this room is listed as 199 square feet. Even though we could not notice much of a difference in size, there was still enough room to maneuver around the room. Like most cruise ships, the small but standard bathroom was off to the side as soon as you entered the stateroom. 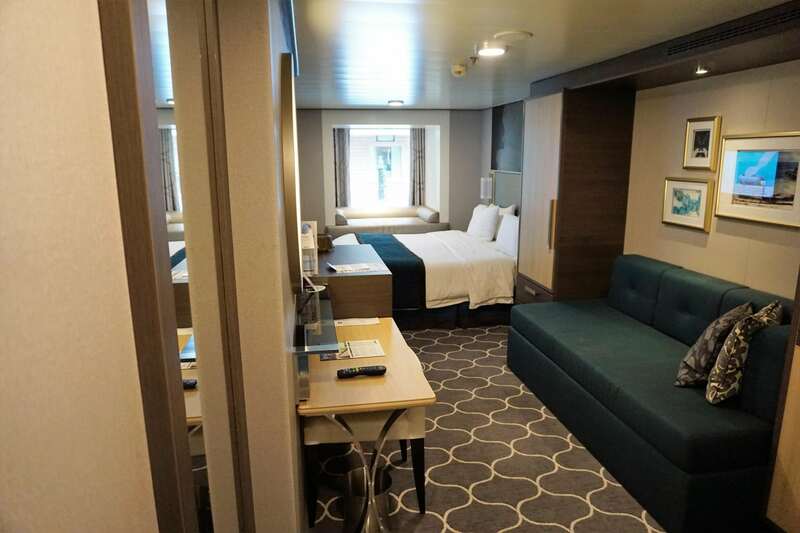 Not expecting much from the efficient layout, we did miss the roomier bathroom from the junior suite we recently experienced on our Oasis of the Seas cruise a few months earlier. 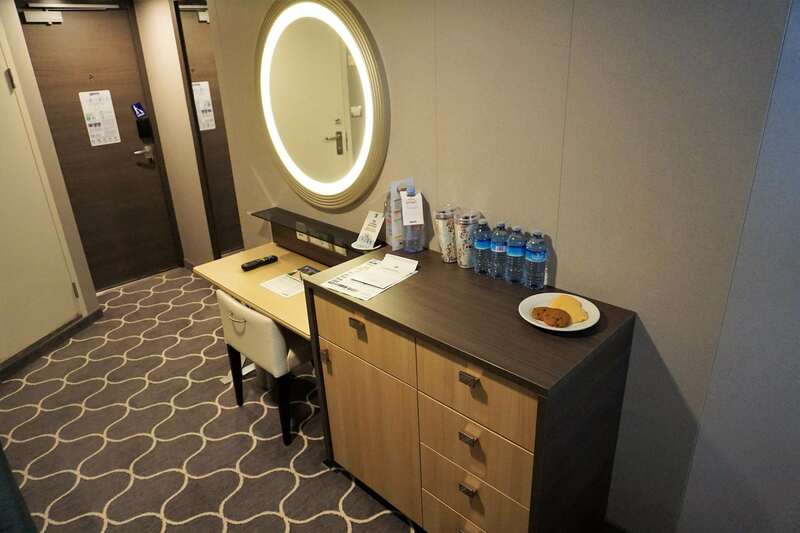 One noticeable difference in the stateroom was the setup of the desk area. Compared to other Royal Caribbean ships, the desk setup lacked storage for toiletry type items and was more akin to the setup on a Quantum-class ship. We did make full use of the drawers in the nearby chest for storing technology and other gadgets. Storage was this biggest downfall in this cabin. As self-proclaimed over-packers, the two small closets gave us just enough space to unpack our outfits. We did miss the over the bed storage area also found on Quantum-class ships, which we used to store our day bags and other accessories. Good thing we brought some heavy duty magnetic hooks which came in handy to get our extras (think beach bags, hats, etc.) off the ground and surrounding sitting areas. As a side note, we also bring magnets for posting the daily compasses and other invites/notices that get sent to the room, especially for Crown and Anchor members. Our “view” was of the sitting area in the middle of Central Park, near Park Cafe. Honestly, we could not see much aside from the foliage, but it did give us the daily opportunity to gauge the current weather conditions, as well as bring in some natural light. Not to mention, the extra sitting area near the window was a nice little location for the Princess’s towel animal collection which usually crowds up the loveseat. The bed was comfortable and rather standard, and the layout of the room had the television positioned directly in front of the bed making it easy to view our online account and the morning show. The addition of USB ports on the desk was a nice touch; although, it would be great if those existed near the small night stands. Still, there was a power outlet next to one of the stands which was perfect for charging our phone (which also doubles as our alarm clock). Given that we paid only $823 a person during Harmony’s inaugural Caribbean season, we felt the room was a great bargain. 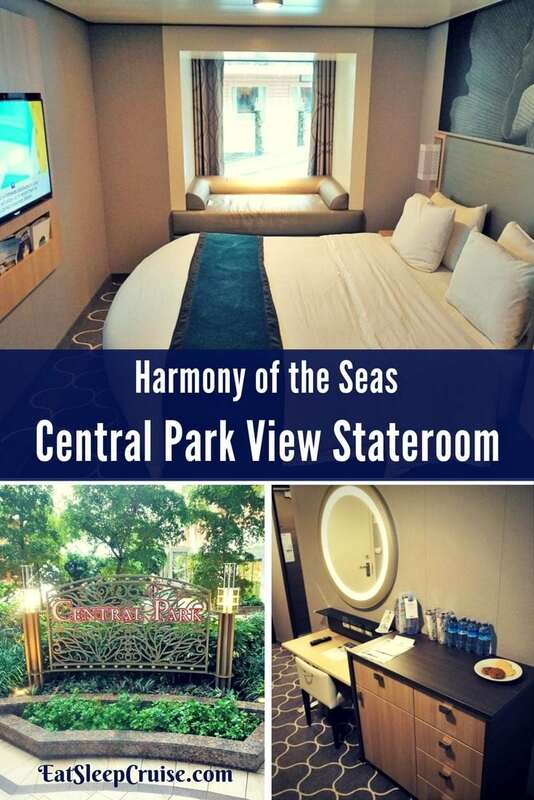 With slightly more space, a convenient setup, and modern touches found on their newer ships, the Central Park View Stateroom on Harmony of the Seas delivered as expected, providing us with the room location and amenities at a price that we could not pass up. 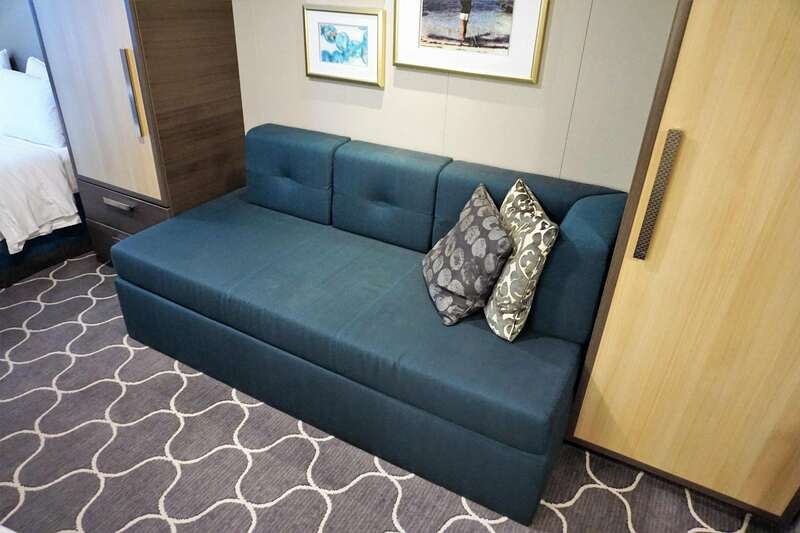 We would recommend this category for those who don’t mind sailing in inside cabins as it is a bit of an upgrade (comparable to Promenade View staterooms on other ships). 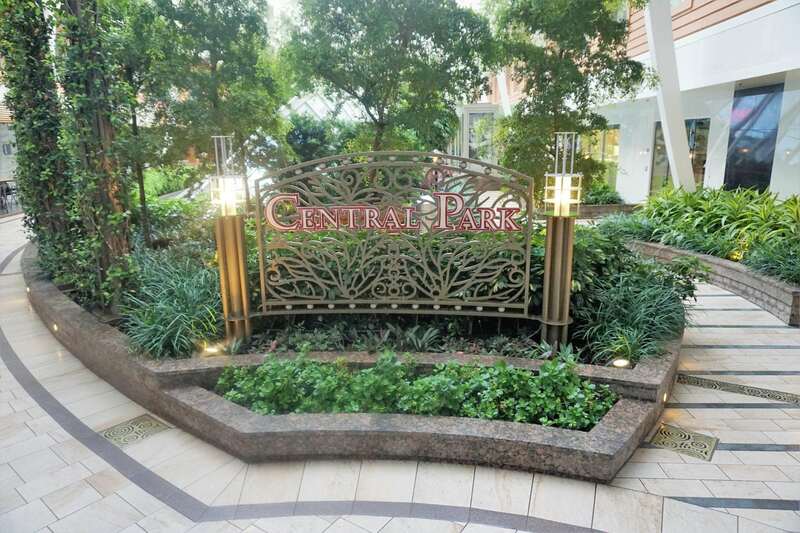 To upgrade to a Central Park View Balcony room starts at an additional $75 a person, which might be worth it if you want the extra outdoor space. Additional perks apply for booking a neighborhood balcony, including complimentary lunch for two, a bottle of wine, and casino gaming lessons. Have you stayed in a Central Park View Stateroom on an Oasis-class ship? Which cabin category do you prefer when sailing on Royal Caribbean? Drop us an anchor below with your cabin preferences and reviews.